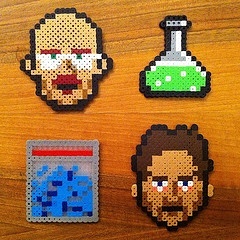 I'm probably a little late in becoming a Breaking Bad fan. I'll definitely admit the series - about a cancer-stricken high school chemistry teacher turned meth-dealing kingpin almost effortlessly pulls you in and is tailor-made for Netflix binge viewing. Interestingly, when it comes right down to it and you strip away the cancer, the meth, and the family challenges - Breaking Bad is really about one theme, one key thing – that actions have consequences. Each Breaking Bad episode typically poses a moral dilemma for Walter White, the main character, and his associate Jesse Pinkman. How the main characters respond to each moral dilemma and challenge is the thrust of the series. We see the characters in a wide variety of scenarios, vignettes and interactions. We also see, very grusomely sometimes, the consequences of the actions the protaganists choose. So what does all this have to do with content marketing? Well, content marketing is usually about one key thing – your product or service. And for each blog post, or white paper, or infographic that you "script," you are focused on that one thing - your product/service. And you're probably focused on that one thing in a variety of situations. For example, do you offer IT support and services? Perhaps you could write about the different ways that small businesses in different industries can use your services. Or maybe, you write about an executive – a main character in business – that faces a particular IT challenge or dilemma and articulate how this executive uses your services to save the day. If - like the writers of Breaking Bad do - you can create appealing, helpful and somewhat addictive content about your one thing and do that on a regular episodic basis you just might be onto something. How are you thinking about your one thing – your product or your service offering? How many different roles or challenges or scenarios can you put your product in to help potential customers realize and clearly understand the value that your company can bring?